Here is about a week's worth of Gray Family nonsense. Most of these have already been posted on my Instagram. That's why there is a coffee rant along with one of the photos. Feel free to follow the crazy over there if you like. As you can see I am not going the route of everything is so picturesque and lovely over here. Sometimes it's happy chaos. Sometimes it's pure frustration. Sometimes it's survival, ha! And yes, sometimes things are quite beautiful. Anyway, enjoy the photo show haha! Just a normal day with The Grays. I couldn't resist photographing him in this light. "Come on Mommy!" Yes master. Where do you want your humble mother servant to go? Can I finish eating my breakfast first? No. Ok.
How the blogging gets done! Man, he's got me! Love this little guy! Haha! There is love and happiness, with a touch of crazy LOL! I would have a hard time doing any blogging with children always at my side. Kuddos to your mothering skills! ;) Cute photos. Thanks! I have my good moments LOL! 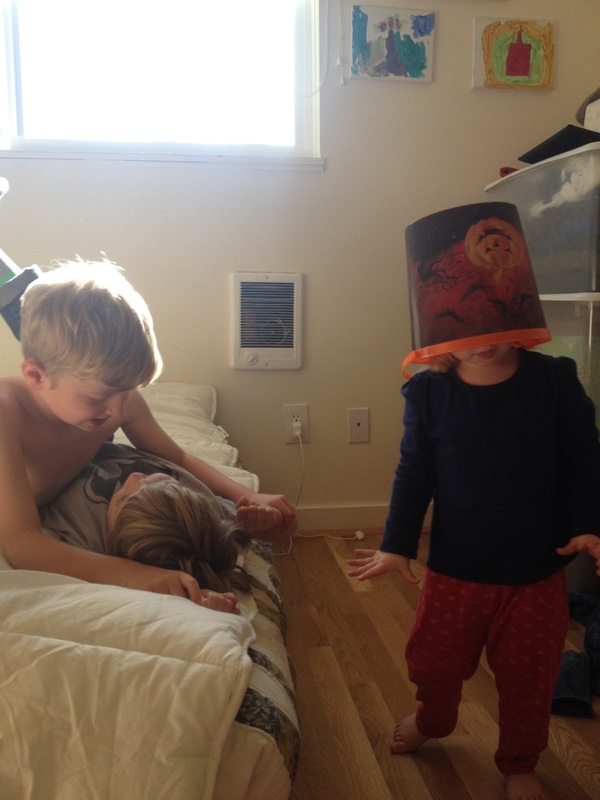 What is it about kids wearing buckets on their heads? My daughter has been doing the same thing every day since we bought her a trick or treating bucket. It's hilarious!